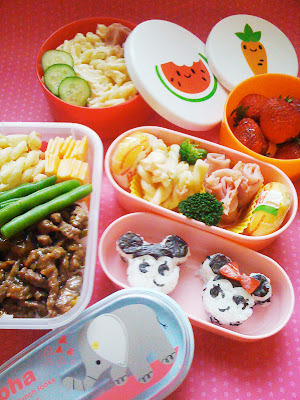 I have Mickey shaped rice mold, so this is Mickey and Minnie Onigiri Bento with ham and cheese and pasta salad for CC. JJ loves pasta salad, so that's what she gets. and the one on the side is for my husband, black bean chicken over rice.